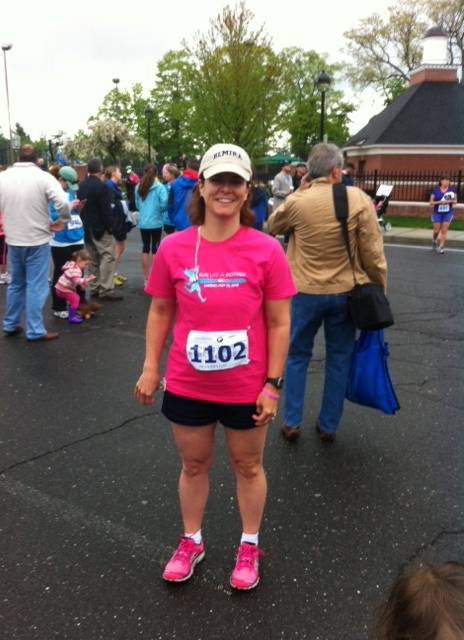 Almost 2 weeks ago I ran in my first 5K race on Mother’s Day. It was a great experience, running with almost 1300 other women. There were families all along the race route with signs, cow bells, and lots of cheers. All of the smiling faces spurred me on. On one particular hill, a child held up a sign that said, “This hill is no match for my mom.” Even though the sign was not made specifically for me, it still motivated me not to chicken out as I strained up the hill. If their mom could do it, so could I! I started running as an attempt to find an exercise that I liked. I really don’t like going to the gym – I find it boring and I don’t see any physical results after going repeatedly. I’m more of a sports gal – swimming, skiing, softball. However, since I have two young children, it’s hard to commit to a league or any regular schedule. So running has provided me with flexibility (if the kids were up too much during the night, I’ll try again to run the next morning), an exercise where I see the physical results, and many other unexpected benefits. I’ve posted on my experiences with running before. I feel amazing mental clarity during and after running. Whatever chemicals are released in your system when running (adrenaline?) give me a real rush. And once I saw the finish line at my first race, I did what I never thought I would do. I sprinted. I passed four women in my mad dash for the finish line. I made sure my stride came down right on that timing mat (just in case, you know?). And I felt GREAT. Going across that finish line gave me such a rush, I was replaying the last minute of the race over and over in my mind for days. Give yourself an aggressive goal and stick with it. Signing up for the 5K made me challenge myself in my weekly running. I didn’t want to make a fool of myself! Be reasonable and forgiving with yourself. Did I run the whole 5K? No. I walked about 3/10ths of a mile on some tough hills and to catch my breath. But that was okay. I finished my first race at 2-1/2 minutes under my best time. Yahoo! Take the high of each achievement (big or small), and use to to push on to the next goal. Now I’m pushing myself to see if I can run the whole 3.1 miles without stopping by the end of June. If I can, I’m going to sign up for a local 8K at the beginning of July. If you don’t meet your goal, try again. I wanted to be done writing the first draft of a new novel by Christmas. Life intervened. But I kept pushing at it, and I’m thrilled that I finished it a few weeks ago. Now I’m revising my first novel, which I’m sure will take a lot longer than I want it to. So best wishes to each of you as you seek clarity, decide what’s important to you, and determine where you want to be. This entry was posted in Inspiration, Katie, Personal, Writing and tagged 5K, Road Running, Running, sports. Bookmark the permalink. Very inspiring words I could use.